The Islamic Republic of Iran also known as Persia is a sovereign state in Western Asia. Iran is the world's 18th-most-populous country and is the second-largest country in the Middle East and the 17th-largest in the world. Tehran is the country's capital and largest city, as well as its leading economic and cultural centre. Iran is home to one of the world's oldest civilizations and has a very rich historical past. The Iranian Rial was first introduced in 1798 as a coin worth 1,250 dinars or one eighth of a toman. It was reissued after a gap in 1932. The first coins of the second rial currency, introduced in 1932, were in denominations of 1, 2, 5, 10 and 25 dinars, 1?2, 1, 2 and 5 rials, with the 1?2 to 5 rials coins minted in silver. In 1932, notes were issued by the "Bank Melli Iran" in denominations of 5, 10, 20, 50, 100 and 500 rials. 1000 rial notes were introduced in 1935, followed by 200 rial notes in 1951 and 5000 and 10,000 rials in 1952. 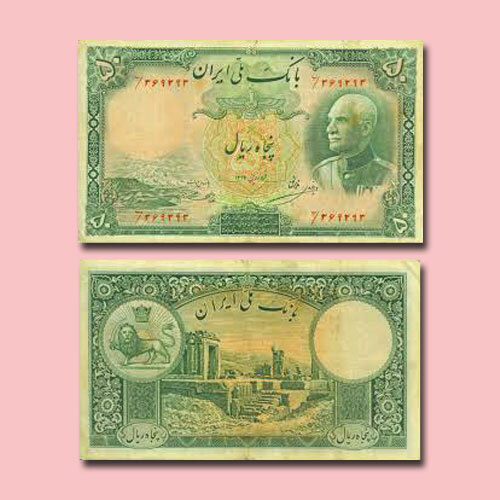 The depicted alongside is a 50 Rials banknote issued in the year 1938. This green has Mount Damavand; Faravahar (Ahura Mazda + Ahreeman), the holy angel of Zoroastrians; Effigy of the Emperor of Iran - Reza Shah Pahlavi on the obverse and the reverse has the Old emblem of Iran: Imperial Crown; Sun; Lion holding a sword; Ruins of Persepolis (Takht-e Jamshid; Chehel Minar) set within Geometric design and floral motifs. The note has the imperial crown of the Pahlavi dynasty as the watermark.